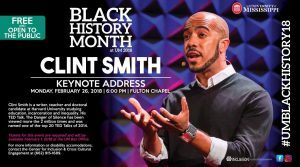 Co-sponsored by the SMBHC, the Center for Inclusion and Cross Cultural Engagement presents Clint Smith, Keynote Speaker for Black History Month at UM. Tickets for this event are required and will be available February 1, 2018 at the UM Box Office. The event is FREE and open to the public.